What Customers are saying about our service .. The gentleman you sent out to clean my bus was terrific. Because of the job he did, and the excellent communication leading up to the wash, you can expect me to be a return customer. Thanks! 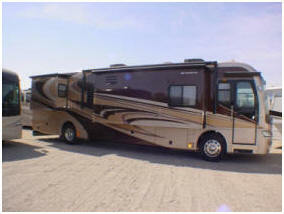 At your home, RV storage, or wherever the RV is located! THIS IS NOT A CAR! Different products and care are needed for the cleansing and protection of those multi interior and exterior surfaces such as: gel – coated, aluminum, chrome, interior leather, Granite, and marble. 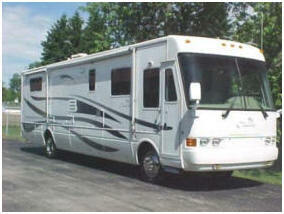 Whether you have a $50.000 C class, a $400.000 Monaco or a million dollar Prevost – We can shine them all inside & out! 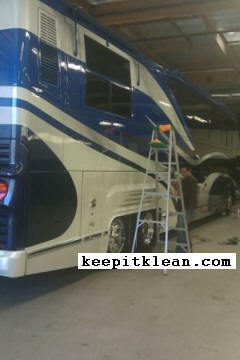 Detailing a RV and protecting it could never be more important. Block out the UV rays, treat the leather, vinyl and paint regularly and maintain long-term value! 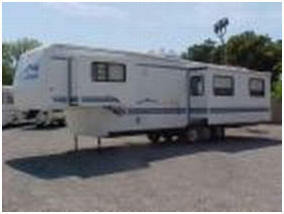 Fifth Wheel-$10.00 to $15.00 per linier foot. 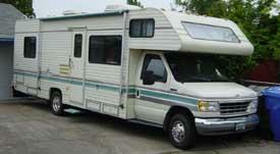 Common Large RV-$10.00 to $15.00 per linier foot. 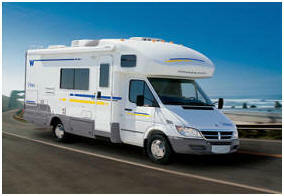 High End RV's-$12.00 to $16.00 per linier per foot .